The Steampunk Forum at Brass Goggles > General Steampunk > Textual > Portrayal (Moderator: The Corsair) > First Fleet recruitment thread. The pirates are massing, freinds. Massing with only one aim in sight; the systematic destruction of all you hold dear. I'm building an armada to stop them but i need crews for my ships. The IFS Zephyr is now fully manned, but the IFS Thunderchild, IFS Hood, IFS Bismarck, IFS Tirpitz, the IFS Titan, the IFS Yamato and the IFS Stark need engineers, loaders and gunners. Who is brave enough to stand against the pirates? Join me now, for freedom and clear skies! Re: First Fleet recruitment thread. Is this in the RPG? No doubt the Boheme' might be of use, if the crew is interested, Patrick amy be of assistant due to his knowledge of pirate tactics. 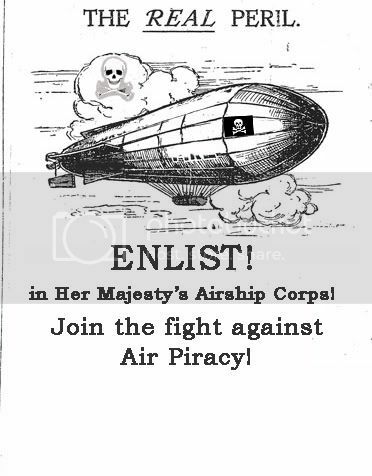 It's in hte conflict against the air-pirates. Which may well be an RPG. We could use men of your caliber, Trakov. 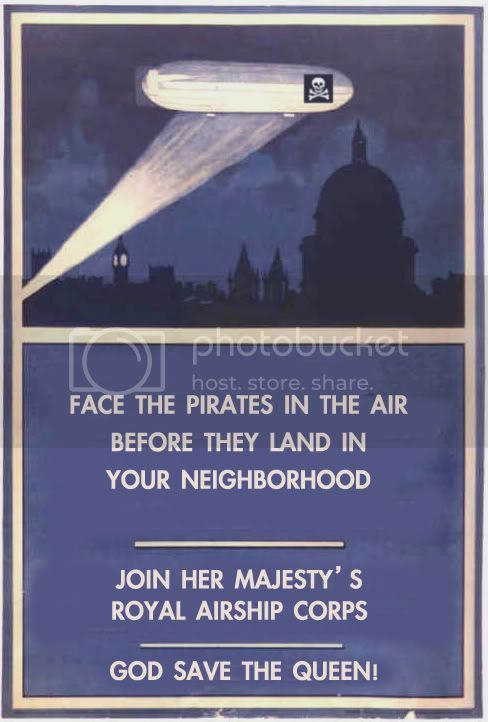 Help us clear the skies. Any help is gratefully accepted, of course. I suggest Ye' consult our good captain 'fer our services, I warn ye, ya cant get such a fine ship and crew on yer side fer' nothin! My goodship Æthercutter as been unjustly called a "Raider" in the past, perhaps because I helped myself to a bit of un-bolted down materials in the past, perhaps because of the seeming overabundance of Medium Voltage Repeating Æther Cannons installed on board. 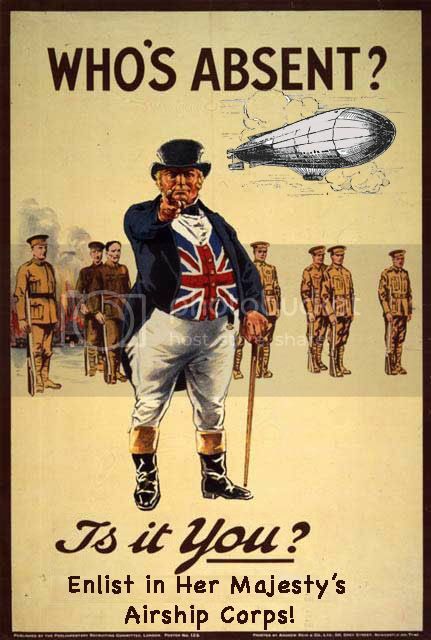 While I will not pledge my allegiance to this forming alliance of "Privateers" (as I believe that Alliances formed on the basis of the Prolongation of anarchic principles is inherently doomed to failure), I will state that I will not stand idly by while the free traverse of the Æther and the Skies is curtailed upon threat of tolls, sanctions or physical threats. As always, my services in materiel transport and surveying are available to all, at pricing to be discussed in person. Those mistaking my refusal to side with a faction for weakness, be reminded that I was accused of Raiding for the dearth of weaponry installed on mine schooner and that said armament may be as easily trained on "Privateers" as Imperialists. I repeat that I will not side with either faction. I simply wish to remain allowed to traverse this Earth as I have for many years, and that attempted sanctions of such movement and business by either Imperial Fleet or Privateer Alliance will be met with unflinching force and resistance. As long as the Imperial Fleet has no intentions of preventing my free trade and movement, I will continue to maintain extremely cordial relations with the Empire and continue to offer my services in high-speed materiel transport and surveying operations, at my usual price. Captain of the air-ship Orfiel. Do it, let's have this out. I'll join the pirate fleet. I have any number of suitable Internet aliases. Well if you got the coin my angels and I have your back. "We're not lost! We're on an adventure!" Convention coverage, shorts, interviews, and vlogs! ᒪᒡᕆᑦᑦe, ᔅᑦeᐊᒻᐳᓐᒃ, ᐊᓐd ᐃᓄᒃᑎᑐᑦ. ᓐoᑦᕼᐃᖕ ᐃᔅ ᓱᑉeᕆoᕐ. The LZ-X1 Württemberg is fully manned and ready. To the victory of the first fleet -Huzzah! Keep shooting, maybe some science will fall out. I applaud your anti-pirate measures. I would join your fleet, but the SS Invictus is a simple cargo ship, surely making excellent prey for those scoundrels. Yes, surely they will swarm upon this poor unarmed merchant vessel at the slightest provocation, for it has no defenses. None at all, really. Not so much as a popgun. Not rapier, nor pistol, nor Chicago Shipyard Industries 37mm Repeating Dual-Barreled Steam-Driven Automatic Cannon, cleverly concealed withing a false pilothouse. Not so much as one of those, nosir. For every day's a war down there, when the gauges all read red. Twelve-hundred pounds of heated steam can kill you mighty dead. That when you speak to them of fear, their laughter's heard in hell. We're more likely to get recruits we have a rather flash symbol. The HMA Todd (aka the "Sweeny") is due to be finished being refitted in July and is seeking recruits for its mission to "shave the skies clean" of pirates, smugglers and other Brigands of the Air. Remembering how Mr. Barker did it, I would like to see how this turns out. ("Mommy, why are the clouds red?" One of my new battleships. A relatively quick, heavily-armed ship, designed to chase pirates down to an optimum range, and put a shell through their hulls. Her low profile and slanting bulkheads also reduce the chances of a damaging hit from a pirate ship. This ship can operate well alone as well as in a group. Anyone want to sign on? Not only can I pay the fee for your services, but also for your ammunition. I can also offer you a berth on the carrier-ship IFS Sehnsucht. It's a deal. My my, it's good to be an independent. The battleferry Alecto stands ready to support your fleet. We will shortly complete loading with our Q-ship kit.